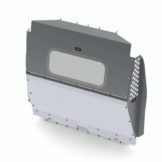 NEW: Award Winning Clear Polycarbonate Max View Van Partition, available now for the RAM ProMaster City, Metris, & Transit Connect. You spend a lot of time in your vehicle driving from job to job, in all kinds of traffic and conditions. 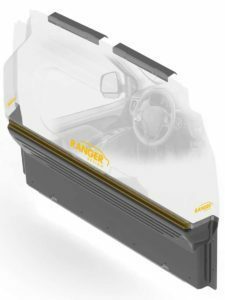 We know that safety is important and that’s why at Ranger Design we’ve engineered van partitions (or bulkhead partitions) to provide a solid, secure barrier between the occupants in the cab and the cargo area. We’ve set the goal of upholding the highest safety standards in the industry and we can prove it by having put our partitions through the toughest tests. In an accident, loose items can become deadly projectiles within the vehicle and can cause serious injury or death. That’s why it’s important to protect the most important asset… the driver with a crash tested van partition. Click here to watch our crash test video . Contoured to maintain seat travel and ensure driver comfort. Contoured to capitalize on cargo area floor space. 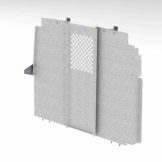 See how contoured partitions are a better fit for your work van. Driver Safety. The van partition will act as a divider between the driver and occupants. If you carry any heavy items, such as tools or equipment, it will protect the front occupants in sudden stops or accidents. Ranger Design partitions far exceed safety standards to keep everyone safe. Reduced Noise. 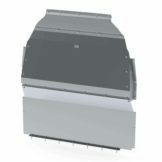 The van bulkhead will isolate the driver from the cargo area and reduce any noise coming from the back area of the van. Driver Comfort. By reducing the amount of space that needs to be cooled or heated, the occupants are given a much better level of temperature control to make for a comfortable ride. Efficient Use Of Space. 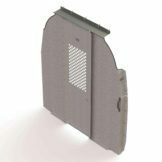 Additional van accessories can be purchased to attach to the bulkhead partition to increase the amount of storage space available in the cargo area. A partition divider will ensure that your van looks neat and organized enhancing your image in the eyes of your clients. Higher Efficiency. Bulkhead partitions allow you to keep your cargo van organized and efficient. By separating the cargo area from the driving compartment you can make sure all your tools and equipment are stored in their proper places. Increased Commercial Vehicle Value. Ranger Design van partitions are built to last and will increase the value of your work van now and in the future.